Megan Hoyt - Shark In Heels, Inc.
As Regional Outreach Officer, Megan is responsible for stakeholder engagement and outreach initiatives in the eight states that comprise the Texas Region: Alabama, Arkansas, Louisiana, Mississippi, New Mexico, Oklahoma, Tennessee, and Texas. 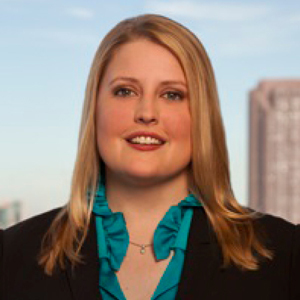 Before joining the USPTO, Megan worked as trademark attorney and civil litigator in private practice in Dallas. Megan is actively involved in the legal community, having served and chaired a number of different committees within the International Trademark Association (INTA), Dallas Bar Association’s Intellectual Property Section, and DFW Women in IP. Megan graduated with a B.A. in Political Science from Southern Methodist University in Dallas, Texas and a J.D. from Washington University School of Law in St. Louis, Missouri. Megan also served as a law clerk for the U.S. Senate Judiciary Committee, a Legislative Intern for the U.S. Senate, and is a U.S. Presidential Scholar.